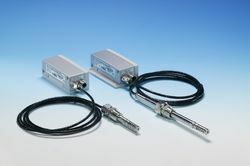 · Proven Vaisala HUMICAP® Sensor, 15 years in oil applications. · Approved for Installation in lubrication system of MAN Diesel & Turbo Two-Stroke Diesel Engines. The MMT330 can be used in on-line moisture monitoring and as a control device, allowing separators and oil driers to be started only when needed. Proper monitoring saves both oil and the environment. With the MMT330 it is easy and economical to monitor the changes of moisture in oil. The MMT330 incorporates the latest generation of the Vaisala HUMICAP® Sensor, which is the result of 15 years of field experience. It was developed for demanding moisture measurement in liquid hydrocarbons. The sensor's excellent chemical tolerance provides accurate and reliable measurement over a wide measurement range. Because of the variety of probes, the transmitter can be used in lubrication systems, hydraulic systems, and transformers. The MMT330 measures moisture in oil in terms of the water activity (aw) and temperature (T). Water activity indicates directly whether there is a risk of free water formation. The measurement is also independent of oil type and age. The Vaisala HUMICAP® Hand-held Moisture Meter for Oil MM70 enables reliable detection of moisture in oil. The probe can be inserted directly into the process pipe through a ball valve without draining the oil in the system. The MM70 measures moisture in oil in terms of the water activity (aw) and temperature (T). Water activity directly indicates whether there is a risk of free water formation. The measurement is independent of oil type, age and temperature. The MM70 has an embedded model for expressing moisture as ppm in mineral transformer oil. The customer can enter up to three other oil models into the meter’s memory. The MM70 features a multilingual, menu-based user interface and a backlit LCD display. The measurement parameters can be numerically and graphically displayed and logged into the meter's memory at the same time. An analog output option is also available. The optional MI70 Link Windows® software in combination with a USB connection cable is used to transfer logged data and real time measurement data from the MM70 to a PC. The MM70 incorporates the latest generation of the Vaisala HUMICAP® Sensor, developed for demanding moisture measurements in liquid hydrocarbons. The sensor’s excellent chemical tolerance provides accurate and reliable measurement over the measurement range. One or two probes can be connected simultaneously. Maintenance teams can use additional Vaisala dew point or relative humidity probes for other tasks. For example, a dew point probe is ideal for checking the moisture inside washed and dried oil tanks. The MMT162 incorporates the latest generation of the Vaisala HUMICAP® Sensor. The sensor is developed for demanding moisture measurement in liquid hydrocarbons and has been successfully used in oil applications for over a decade. The sensor’s excellent chemical tolerance provides accurate and reliable measurement over the measurement range. Due to its compact size, the MMT162 is quickly and easily installed in tight spaces. Units are delivered fully assembled, however, you can reconfigure them to suit your needs. 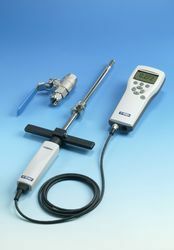 In combination with an MM70 indicator, the MMT162 provides an ideal tool for on site calibration. The MI70 indicator can be used as a display, communication, and datalogging device for the MMT162. The Vaisala HUMICAP® Moisture and Temperature Transmitter Series for Oil MMT310 is a fast and reliable online detector for moisture in oil. The MMT310 series incorporates the latest generation of the Vaisala HUMICAP® Sensor, developed for demanding moisture measurement in liquid hydrocarbons. The sensor’s excellent chemical tolerance provides accurate and reliable measurement over the wide measurement range. The MMT310 series measures moisture in oil in terms of the water activity (aw) and temperature (T). Water activity directly indicates if there is a risk of free water formation. The measurement is independent of oil type, age, and temperature. PPM units are traditionally used in transformer applications. They indicate the average mass concentration of water in oil. The ppm calculation for mineral oil based transformer oil is optional in the MMT310 series. The MMT310 series can be used in lubrication and hydraulic systems as well as in transformers. It can be used for on-line moisture monitoring and as a control function, allowing separators and oil purifiers to be started only when necessary. The MMT318 has two adjustable probe lengths. The transmitter can be ordered with a ball valve set that enables the insertion and removal of the moisture probe for calibration, without the need to empty the oil system. 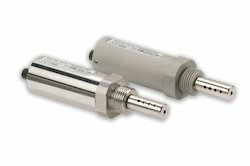 The MMT317 has a small pressure tight probe with optional Swagelok fittings. The MMT310 series has two analog outputs and an RS-232 serial output. The output signals and the supply power travel in the same cable, the only cable connected to the unit.